Officially, around 30,000 people suffer from HIV Aids in Panama. But given the stigma attached to the illness, that number is probably only indicative. As in many other parts of the world, the Catholic Church runs centres and foundations, like this one, to assist various disadvantaged categories of people with varying degrees of disability. Four of these Church foundations, represented by 60 people, came together at the Good Samaritan Shelter on Sunday for what was a particularly touching and intimate encounter with the Pope. 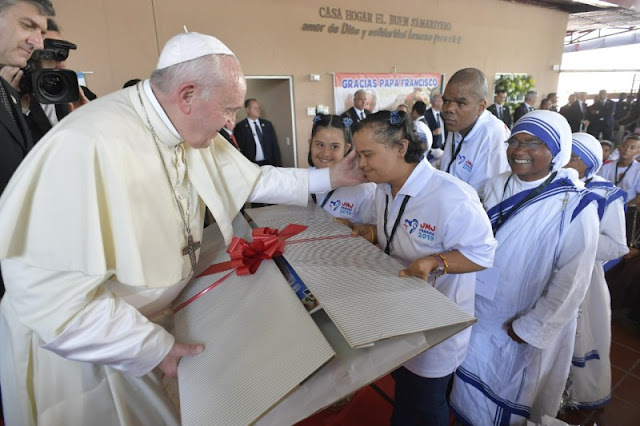 After listening to their stories and accepting their gifts, all hand-made by the participants themselves, Pope Francis noted how “the maternal face of the Church” is capable of “creating a home, creating community”. And creating a home, he continued, “is to create a family”. A home, said the Pope, “demands that everyone work together”, it means learning patience, and forgiving one another”. And that is how “the miracle takes place”, said the Pope. “We feel that here we are reborn, because we feel God’s caress that enable us to dream of a more human world”.